This recipe was made up on a freezing cold day last week, one of those days where you hibernate and dream of sunnier times- we were in our basement office, not wanting to spend another dreary second outside. We are really feeling like little hermits beneath the street level- one hot drink after the next and complaining about the bloody English weather. In the midst of these never ending cold bleak times one needs comfort and preferably with lots of spice- piping hot and in a bowl with grated cheese. For us the number one comfort food is pasta! Whose isn’t? It’s quick and instant to make and always pleasingly delicious. We find ourselves eating it most nights of the week. 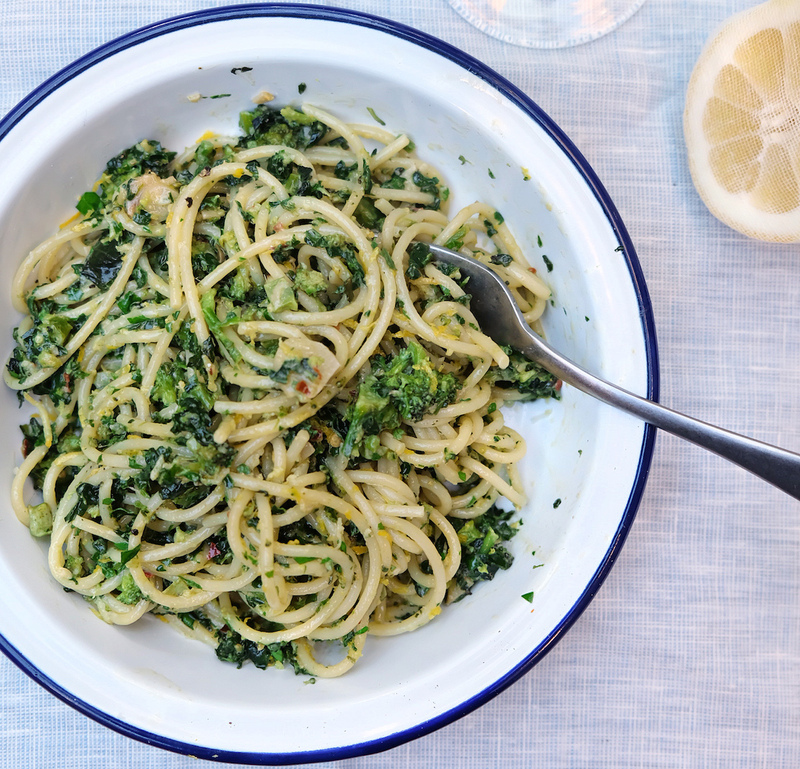 This is an easy dish, packed full of greens to keep you Popeye strong- but best yet it’s using what’s fresh and abundant at the moment. Jemima has been coming back from her vegetable patch in Somerset with great big bags of cavalo nero, its even been bagged up completely frozen- it’s the thick dark Italian cabbage, also known as Tuscan kale, black cabbage, black kale. Its extremely versatile, with a wonderful rich, intense and slightly sweet flavour, which means it can be used in a number of different ways- with all the same health benefits as Kale. Delicious in soups or with your Sunday roast tossed with chili and garlic. We cleaned all the bugs, worms and good Somerset soil off of our bunches and brought the smells of a Tuscan kitchen to our underground dwellings- tasty smells of garlic, dry chilli, anchovies and spaghetti on the boil. We recommend using good old dried spaghetti for this with plenty of grated parmesan. Steam your cavalo nero and broccoli, so the cavalo nero is tender and the broccoli still has a little crunch- around 3-5 mins. Put the cavalo nero in a magimix and pulse until its finely chopped, then add the broccoli and pulse until its chopped into little bits. You can also just do this with a knife. Heat a good glug of olive oil in a big pan and slowly fry your garlic on a low heat with the dry chilli, stirring occasionally. When the garlic is golden add the anchovies and break up until they desolve into the oil. Add your greens and toss through- followed by the cream, lemon zest, and juice, chopped parsley and cheese. Season well. Toss in your spaghetti. Serve hot.